CGC, or the Certified Guaranty Company was the first, impartial, third-party certification service. A division of the NGC, CGC was founded and providing grading service since 1999 with its whopping 5,000,000th book graded in 2018. What kind of books does CGC certify? 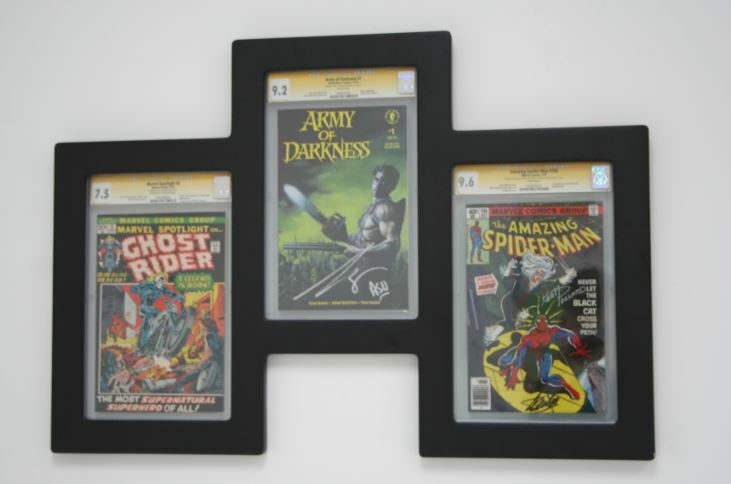 As per the parameters above, they will not grade trade paperbacks (TPB), Hardcovers or novels due to the process and encapsulation limitations of a CGC slab. What do the different colored labels mean? Blue: This is also called the “Universal Label.” This is the most basic category for books. It’s for a regular comic book that just requires grading. There are no special qualifiers for the blue label, and is typically used to preserve books. It’s pretty straightforward.. This could be an older book, a new release book, and anything else in between. Yellow: This is the Signature Series Label. This is used for books signed by someone of significance to the comic book such as the writer, artist, cover artist, actor that portrays the character in a movie etc. In order to receive a yellow label, the signature on the book must be witnessed by a CGC representative, which authenticates the signature. This ensures that the book is signed by who it says it’s signed by, and CGC knows it. This means that the signature itself does not have to be studied or authenticated, because the CGC witness verifies it. This is important because in the future, should you decide to sell the book, anyone purchasing your book will feel more comfortable because the CGC process eliminates the ability to swindle, deceive or ripped off. Yellow label is preferable for those looking to sell books in the future as it assures buyers the authenticity of the book and book quality, as well as the signature and signature quality, which results in having the freedom to get the most value out of your books. This is particularly helpful for those who sell their books online. ONLY a witness at a CGC sanctioned event can qualify books for yellow label grading. These witnesses are available from the CGC booth at said events, and are there to travel with event-goers to the signings to authenticate signatures..
Purple :The Purple label or “Restored Label” denotes that the book has been repaired (shows evidence of repair) so that it will look just as it did in its original mint condition. This designates that it had some sort of refurbishment treatment whether it be washing the book with organic or inorganic solvents which can remove staining or tanning, restoring brittle pages, tape removal, spine or page replacement and color touch-ups. On the purple label, another grade is given to the QUALITY of the restoration. This identifies whether it was a small, professional restoration (an A-1 grade) all the way to extensive overhaul amateur restoration (graded as a C-5). This grade does not supersede the grade of the comic, rather it is an additional grade to be considered alongside it. This gives an accurate depiction of what level of work and time was invested in the book, and how close it is to its original condition. What is the difference between a 9.8 grade on a signed “qualified” green label vs a signed book signature series yellow label? What does this mean for the value of my book? Yes! It will provide protection and display-ability to your comic and increase its value both to you and the secondary market. For books that you want to preserve for sentimental or collector reasons, or for high value signed or unsigned books you intend to sell in the future, CGC is the best route. How/Where can I submit books? You can submit books a few different ways, through a few different places. Midtown Comics Times Square for example, is one that can facilitate the CGC process by assisting with the paperwork, and handling the shipping and shipping costs for a fee. Also, any book signed at one of Midtown Comics signing events will qualify for Yellow Label. This is because Midtown Comics has their own CGC certified witnesses for their signings. This save you a lot of time and effort because Midtown Comics will help fill out the paperwork, and cover the packaging and shipping to the CGC warehouse in addition to saving you the cost of a convention ticket. Most of Midtown Comics signings are free to get a book signed, but for CGC there are artist fees and additional CGC costs. Fees are set by the artists and therefore vary. Purchase of a book for the signing in the store is required, but customers can typically pick up a book for less than $5. This makes the CGC yellow label accessible to fans and collectors who don’t attend conventions. *Note, this process cannot be used for YELLOW LABEL Signature series (signed books). 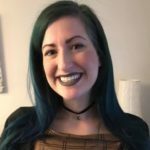 What is the process like after I submit my book? Once submitted through our service your book/s will then be transported to our warehouse where they will be packaged securely then sent to CGC headquarters in Florida. Then, verified graders carefully examine the book for imperfections such as dents, stains and creases in the spine. Next, your book is *10 being gem mint* graded on a scale of 1-10 and carefully enshrined in a heavy plastic protective case known as a “slab” with a grading label. The grading label encased on the top displays important details (such as who it is signed by) and the numbered grade. Finally, it will be shipped back right to your doorstep protected, graded and ready for display. The whole process takes a few weeks, and you can follow your books trajectory back to you by using the invoice number. This is subject to an entire array of variables that change based upon value, age and condition. Separate programs such as the Signature Series program have different requirements to the normal Comics Submission and also the magazine submission. This is best left to one of our professionals to help guide you through the process! What does it mean to “grade” a comic book? To “Grade” a book is to examine each page for rips, tears, bends, doodles or anything else that can knock a book down in grade. The grade represents the condition. A mint condition book, never opened or read will receive a higher grade. Every book starts at a 10 but then must be examined for any and all damage. However, if there is a printing defect on a book CGC will be aware of such matters and the defect will not be graded against, whew! 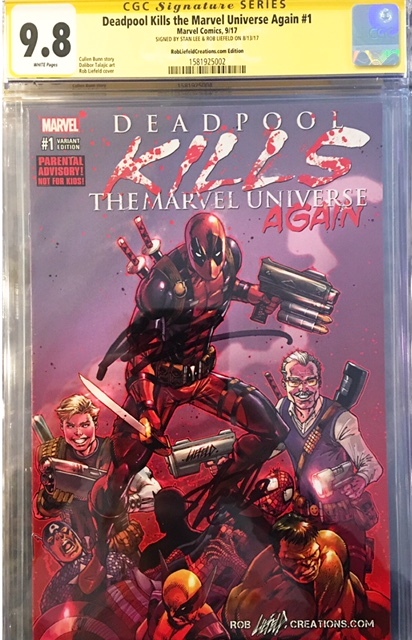 What books are worth CGC’ing (Grading)? This is a matter of taste and what is important to YOU! Do you like the super rare incentive variants that are brand new by the hottest artists and writers today? Do you have a more vintage appeal to yesteryear? Maybe you still hold tightly on to your first comic you ever read. The choices are boundless to you and what matters to you. The process normally takes around 6-8 weeks by nature but can be slowed to an almost 10 week wait during con season which starts at San Diego Comic Con and goes till New York Comic Con in October. Additionally if you wish to use CCS to press you can tag almost an additional 5-6 weeks on that, ah the things we do for that 9.8! Of course to alleviate these waits there is always the Fast Track service which will cut that wait time in half! What is a CGC witness? Do I need one? A CGC witness is an individual certified from CGC to be their eyes and ears at signings in order to verify signatures as authentic. The witness’s job is to attend signings and watch closely as every book is signed to ensure that every signature is valid. 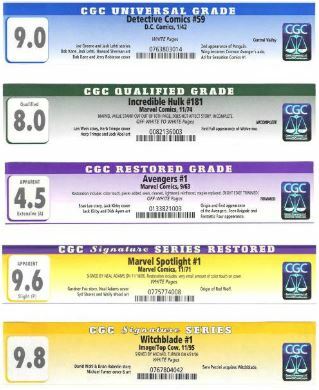 A CGC witness is necessary for any Yellow Label Signature Series submissions. For any other color label, blue, green or purple, a witness is not required. I have a signed book with a certificate of authenticity; does this qualify my book for the Yellow Label? Unfortunately no. The only “certificate of authenticity” that CGC recognizes for their Signature Series (Yellow Label) is the CGC witness’s verification. A book signed with a certificate (or no certificate) would have to be submitted as a green label book. This is because it’s “missing” the authentication from a CGC witness which would qualify it for the Signature Series Yellow Label. What events are CGC witnesses usually at? Midtown Comics also has their own CGC witnesses on site for our in-store signings. This allows for Yellow Label processing at these events. Normally this is restricted for conventions and other events in which CGC has a presence. CGC has presence at most comic conventions, most notably, ComicCon. I got an invoice, what do all this information mean and what do I need to know? Contact information: Name, address, e-mail and phone number are all used by CGC to re-ship your CGC’d book back to you. Be sure that the information you provide is clear and accurate, and the address listed is the one you would like the book shipped to. If the company has any questions, concerns or issues, they will use the contact information listed to reach you. Insurance “cost”: The “cost” listed on the form directly to the right of the book title represents the insurance value for the book. Pressing: These are choices for an additional service for an additional cost which you can add to gussy up your book for either a chance at a better grade or fix and preserve books or reduce wrinkling or other minor damage for the future. Invoice # : The invoice number will allow you to get information on the status of your book from CGC. A few weeks (3-5) after your book is sent out you can track its progress through CGC and back to you. There is a CGC phone number at the top of the form, or included in an e-mail for confirmation. Calling that number and referencing your invoice will allow you to check on the delivery status and date of your book and its journey back to you. Can I read the comic after it’s sent and protected in the CGC slab? Unfortunately, no. Once it’s sealed in the protective slab, it can no longer be pulled out and read. Although you can remove the slab in the future, if it’s damaged, you want to read the comic, change your mind etc. but that is a permanent removal. To get it back into a slab, you would have to go through the whole CGC process again including shipping, paperwork fees etc. As well as risking whatever grade you currently have. That’s why we suggest if you are looking to CGC a book, especially a new release, it’s beneficial to buy a copy to read, perhaps a trade paperback, or a basic (non variant art cover) and reserve the more expensive art covers or signed books for CGC protection. I live out of the country. Can I have a book CGC’d and shipped to me internationally? Yes, but there are higher fees for international shipping, depending on which country you need it shipped to. Can this service be applied to online purchases in the future? That would be a great salting point as well. We are currently working on making something like this happen! As it is right now, we can only take CGC submissions in-store, but we want to make this service available to our online shoppers as well, so keep a look out for this in the near future! Just want to know how much does the process of grading cost. This depends on a few things including what specific item you are looking to get graded. 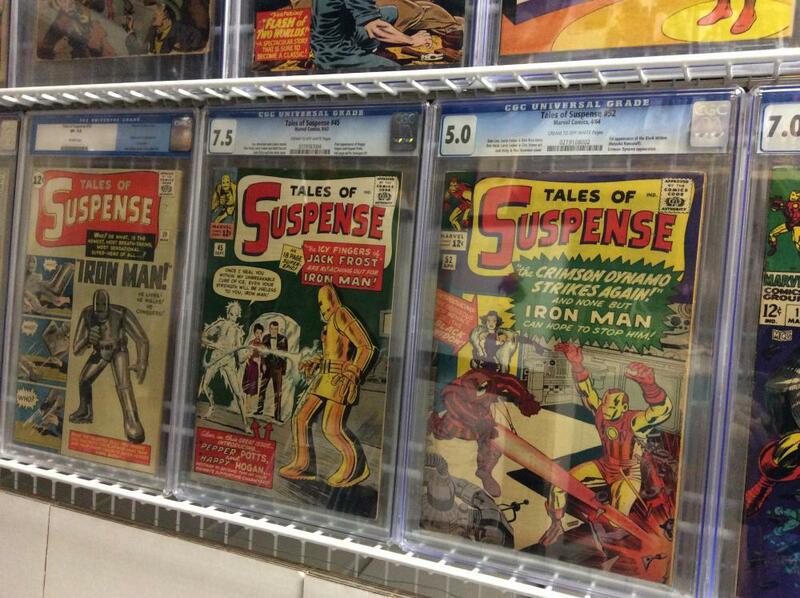 Golden Age Comics, magazines, Modern comics etc all have different pricing structures because of their value. Your best bet is to come on down into the store or call and one of our CGC experts will walk you through it! hello i live in France and i would like to have some of my comics reviewed by cgc? how to do?thank you for your reply.